Update March 16, 2017: About two and a half years have passed since this horrifying event. My understanding is that Sonya Spoon has been in jail since the night she killed her two small children. Yesterday, she pled guilty to their murder, part of a plea agreement that will allow her no fewer than 35 years in jail. She will be sentenced on June 7. She will live that time knowing that she killed her children. I hope she has gotten help with her mental illness, which was certainly a factor in this. That doesn’t make her innocent. Maybe it helps the rest of us to vaguely understand what happened. Maybe not. Some sad good may come of this case. Per this news report, legislation is being introduced in Maryland that will alert social services not only when children are harmed, but also when they threatened. Surely you’ve seen the photos and heard the news: 24-year-old Sonya Spoon admitted to murdering her two small children. It’s a tragedy from any objective view. You’ve probably seen the photos from Sonya’s twitter feed, the sweet pictures of her children. Heartbreaking to see them now. It’s possible that the lyrics reminded her, as an adoptee, of her Russian mother. It’s possible they reminded her of the father of her child. It’s possible they reflected how she felt in the world. It’s possible it’s none of these things. Sonya’s tragedy hits close to me because the murders took place in Cheverly, Maryland, where my kids, all now in their mid-20’s, grew up and still live, and where they rode the bus as kids to the same elementary school as Sonya and her brother. I remember seeing Sonya, a little blond child, when she was adopted at the age of 3 from Russia. I think that would have been in 1993, around a time I was working professionally in adoption and becoming aware of the very tough realities of Russian orphanages and baby houses. I knew the family only in passing, to say hello to when we passed in halls of their elementary school, or walked by their house, around the corner from ours, en route to the Cheverly Community Center. We never know the sorrow and struggles of those we pass by. How could a mother kill her two little children? I have no answer or insights about that, just incredible heartache for the children, their mother, their fathers, their grandparents, their playmates, their family, their friends. Sonya, whatever the judicial system outcome is, will have to live the rest of her life with the knowledge that her children are dead, and that she killed them. Of course mental illness played a role here. I would guess adoption did too, and we have to stop being afraid to recognize how trauma affects individuals. I’m not saying this happened because she was adopted. Please. I’m saying that what happened to her in utero, what happened to her during her early childhood, what may exist in her genetic history, what the impact of being separated from her biological family may have had–much of that is related to trauma and loss. There is a spectrum to trauma, trust, and grief around adoption, and many children are resilient. Most grow up to be strong, healthy adults. Some have deep, dark, lifelong, real struggles. I don’t know what went on in Sonya’s head. I feel certain that her parents tried to get help for her, that they loved her and their grandchildren deeply, and that the complexity of their grief right now knows no bounds. Anyone who has struggled to help a loved one, adopted or not, with mental illness knows well how tenuous the lifeline can be, how mentally ill people can accept and reject help, how high hopes can be for the right meds, the right therapy, the right treatment. And how easily those hopes can be dashed. In most cases, of course, we muddle through, perhaps not elegantly but nonetheless safely, though often not without scars. My final point here is a minor one, perhaps, but still. You’ve seen this photo of Sonya from news outlets, which many have thought to be Sonya’s police booking photo. Many have asked how she could smile in such a photo. It’s from her driver’s license. This doesn’t condone the crime, or the guilt, or the tragedy. It does suggest we often don’t have the full story when we pass judgement. As a mother, as an adoptive parent, as a grandmother, I grieve. It’s all I can do. I recently attended a weekend workshop called “Healing From Trauma with Yoga, Writing, and Nutrition,” held at Seattle Yoga Arts. I’ve been fortunate not to have had a lot of trauma myself, though many people whom I love deeply have experienced trauma. I’ve dabbled in yoga. 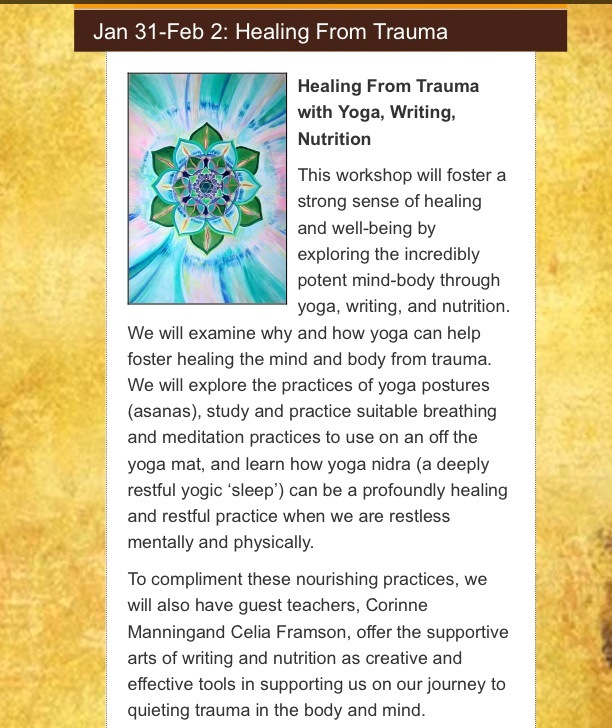 I love that this workshop combined yoga with writing, since I do lots of that, and with nutrition, because the way we nourish ourselves, and our feelings about food, can have a great impact on the way we heal and thrive, emotionally and physically. 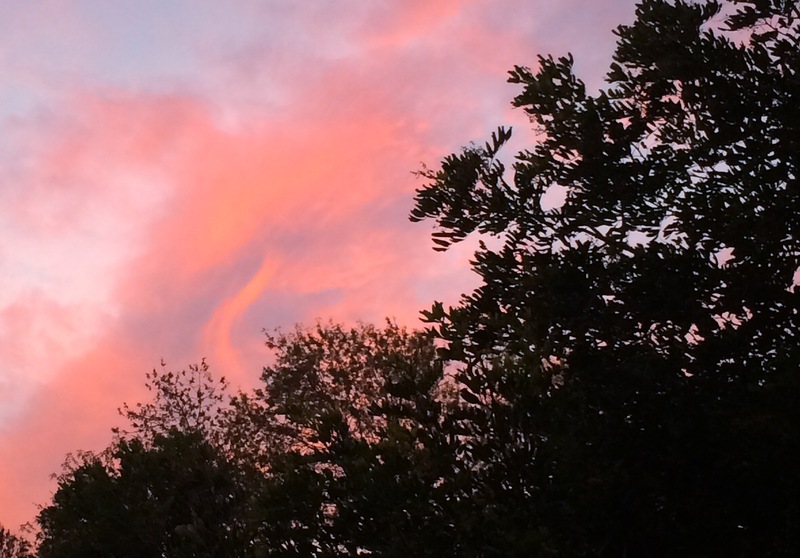 I attended the workshop to see how all this might merge together: yoga, writing, nutrition, trauma, and healing. Traumas can be physical, emotional, psychological, or a combination. Doctors talk about trauma as significant, sudden damage done to the body. Trauma also can mean an emotional response to a terrible, unexpected event, something that shatters our sense of security, of feeling safe. These events can occur in childhood, when we are unprepared and powerless to prevent them. Traumas can be a terrible accident or a natural disaster. They can happen to toddlers, to highly trained soldiers, to athletes, to anyone. Sometimes right after the event, we deny or minimize what happened. Sometimes, we recover quickly. When we don’t, later on we can have emotional symptoms (feelings of sadness, hopelessness, guilt, shame, self-blame, anxiety, and fear; mood swings with anger and irritability; withdrawing and feeling disconnected) and physical symptoms (being easily startled, having difficulty concentrating or sleeping, feeling tired or tense). Symptoms can fade, and people can recover. Sometimes, symptoms can be triggered (well after the event) by reminders of what happened, reminders that can be based on the calendar (anniversary dates of a death or disaster), or on an unexpected reminder (a sound or smell, a picture of something that traumatized us). Adoption is a trauma. We adoptive parents may not like to think about it that way–I certainly don’t. Still, it’s true. Though it’s not labeled as such, that list describes reasons children are placed for adoption–and why it is trauma. Significant separation from a child is also trauma, and thus adoption can be traumatic for birth/first mothers, fathers, and siblings as well. Some adoptees recover from the trauma well, as do first parents. Some struggle throughout their lives. It’s a spectrum. Why is one person resilient, and another not at all? Maybe that question, though, is just a distraction. The key is to accept the reality of trauma, to be aware of the impact of trauma, and to be open to helping oneself and others to heal. Yoga is one good resource, perhaps especially because it connects the mind and the body, providing means to soothe the brain, and thus allow the body to better bear the physiological responses to stress and the triggering recurrences of trauma. Slow, steady, purposeful breathing really is a big deal. Counting to 10 is only half the point: breathing slowly in and out, letting the body and mind get steady, is even more helpful. Let go of any stereotypes about yoga. I admit I was heartened this weekend when our yoga group was not entirely high-toned reeds, because I always feel a bit daunted in those classes. Our group had a few um violins. A cello or two. It worked well. We were encouraged to take care of ourselves, to talk about our expectations for class time, and to say what we hoped to take away from it. Safety was central: emotions, abilities, and efforts would all be safe, and accepted. Giving our beloveds (family members, friends, colleagues) space in which they are safe is a meaningful gift. I want to emphasize this. Making a safe space–doing so with clear intention–may be one of the best gifts we can give to anyone who has experienced trauma. What does this mean? To me, it means that assuring (and backing it up) loved ones that when they are with us, they will be safe. We will listen to their needs deeply, we will accept the needs as they are expressed, and will partner with them, where they are. This could mean figuring out ways not to startle them, or best ways to express concern or affection, or what words are least/most helpful. This weekend, we practiced different, gentle yoga positions, always encouraged to pay attention to our bodies, to notice what the muscles and joints were saying–and to breathe. This was “restorative yoga” we were learning: ways to restore energy and promote healing. Our wonderful instructor, Bianca Raffety, told us to pay attention to pain or discomfort, and to pay attention to what felt good. That was powerful. When we focus on what causes pleasure, in a healthy way, we can focus on maintaining or re-creating it. That’s true in yoga, and in other parts of daily life. Meditation is often also powerful. Children can learn to meditate. The brain clears, the mind calms, the body regenerates. We are so over-tired and over-electronified, and over-loaded with information. What if, when we woke in the morning, we didn’t immediately reach for our cell phones? As a result of this weekend, at night I’m putting my phone in another room to charge, rather than on my nightstand. I’m going to use my waking up time to pause, breathe, and maybe meditate a bit, before bounding into the day. Who knew? I love unexpected, positive connections. May we be open to healing and strength, and to new possibilities.